Tree Protectors provide your trees with good growing environments that promote quicker growth. They create a miniature greenhouse type environment for each tree and encourage vertical rather than lateral growth. 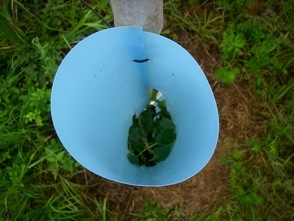 Additionally, tree protectors will provide some water for the trees as water will condense on the tree protector and drip to the ground. Tree protectors also protect your trees from wildlife and human damage. Deer will often browse on the leaves and branches of young trees, and other animals will gnaw on the bark or roots of the trees. Bucks also have a habit of rubbing their antlers on young trees, especially those planted in open areas. The damage caused by these actions can reduce the rate of growth and possibly even kill your trees. Properly installed tree protectors can eliminate most of these hazards. 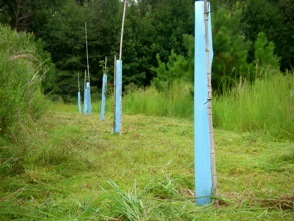 Tree protectors will also give your trees some protection against damage due to weed control measures. 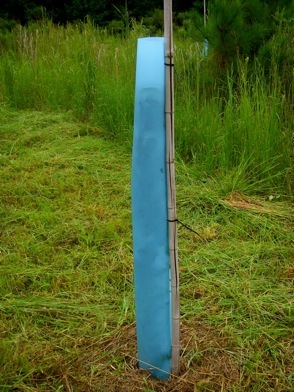 Tree protectors create a barrier around your trees that provides some protection against herbicides sprayed near the trees, reducing the risk of accidentally spraying and killing the tree. Additionally, tree protectors are much easier to see than the tree itself. Being easily able to identify where the tree is makes mowing and weed eating near the trees much easier for you and safer for the tree. * Tree protectors do not protect trees from weed eater damage! Our tree protectors are constructed of a durable, U/V stabilized material that can withstand the forces of nature for years. Our tree protectors can be easily installed after the tree is planted and removed when it is no longer needed, allowing it to be used more than once. They are easily secured to a stake with zip ties or string (stakes/ties not provided). If you need more tree protectors than we show available, please contact us and we will be happy to assist you with your order. We do not ship to Alaska, Hawaii, or outside the United States. **PayPal ITEM SOLD OUT notice** If you order more tree protecters than are available you will get a message from PayPal that the item is "SOLD OUT" even though it is not. We do our best to provide current inventory levels but have difficulty keeping the information up to date at all times. If PayPal states that the item is sold out but the information on the website says it is still in stock you may try ordering fewer. If you need more tree protectors than are shown in inventory, please contact us and we will do our best to meet your needs. Tree protectors will ship when we ship your trees. Orders for tree protectors only will ship as soon as possible. See our Shipping page for more information.